.It allows weak or injured legs to be safely repositioned. .It is perfect for those suffering from arthritis or recovering from surgery or injuries. .The strap helps to reposition a leg on a wheelchair, on a bed or even lift a leg up into a vehicle. the leg lifter strap allows the affected leg to easily be maneuvered into place. .Useful for safely repositioning the leg on a bed, wheelchair, or even lifting up the leg in a vehicle. .Perfect for physical therapy or occupational therapy, the rigid leg lifter strap safely increases mobility after hip replacement surgery. 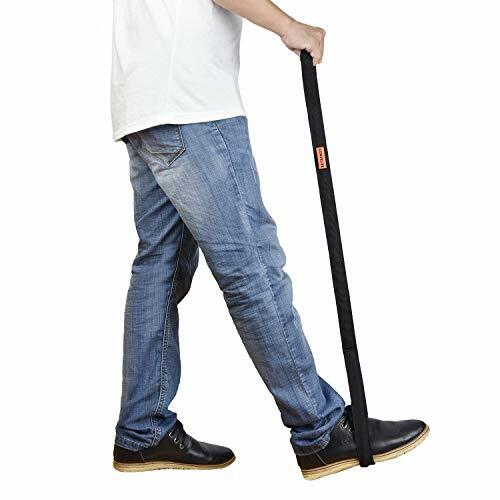 .Durably constructed, the leg lifter strap has an internal stiff plastic rod that is rigid enough to handle leg casts with ease. .Designed to ensure the foot does not slip, the rigid foot loop is large enough to accommodate any size foot, with or without shoes and also accommodates casts. .The rigid loop allows the foot to easily be positioned without bending over for additional convenience. .Reinforced by a durable stiff plastic rod, the 44" nylon strap maintains its rigidity to easily lift and reposition the leg. .A convenient hand loop creates a comfortable and secure grip for repositioning the leg. .The wide 26" foothold is flexible to easily conform to the foot or shoe for a secure fit. EASILY MANEUVER WEAK OR INJURED LEG: Whether recovering from a leg injury, hip surgery or suffering from arthritis, the leg lifter strap allows the affected leg to easily be maneuvered into place. Useful for safely repositioning the leg on a bed, wheelchair, or even in a car or SUV. INCREASES MOBILITY: Perfect for physical therapy or occupational therapy, the leg lifter strap safely increases mobility after hip replacement surgery or other hip or leg injury. Durably constructed, the lifter strap is strong enough to handle leg casts with ease. LARGE LEG LIFTER LOOPS: Designed to ensure the foot does not slip through, the rigid foothold loop is large enough to accommodate any size foot or cast, with or without shoes. The rigid loop also allows the foot to easily be positioned without bending over. DURABLE STRAP WEBBING: Reinforced by a durable and stiff plastic rod, the 44" nylon strap maintains its rigidity to easily lift and reposition the leg. The nylon hand loop creates a comfortable and secure grip for repositioning the leg. The wide 26" foothold is flexible but rigid to easily conform to the foot or shoe for a secure fit. CONVELIFE GUARANTEE: 60 day unconditional guarantee so you can purchase now with confidence. If you have any questions about this product by CONVELIFE, contact us by completing and submitting the form below. If you are looking for a specif part number, please include it with your message.